FeuerThoughts: What is wrong with this picture? I was in Las Vegas (Mandalay Bay Hotel and Convention Center) for the Collaborate07 Oracle User Group (s) conference. As usual, a very surreal experience, which was certainly driven home by this poster in the hotel elevator. So....do you notice anything odd about the poster? 1) Sharks face seems like it has been modified to look sad. 2) Main Dorsal fin seems to be missing although I believe I see a shadow of it. 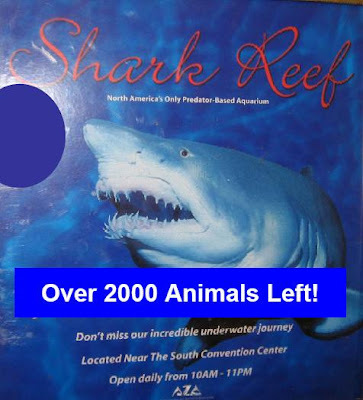 3) The words below the "Over 200 Animals Left!" banner are slanted. that if you dont go to see this attraction soon there will be no animals left. First, it looks as if someone has dubbed the sharks face. The eye almost looks like a sad forlorn look and to add to this its mouth almost looks like it is frowning. My only other thought is them main dorsal fin might be missing but not clear. Thats my two cents. How many animals over 2000 are still left? Where in the world was Steven Feuertein? When AP is the enemy, who is our friend?